Summary: The current cost to build a basement is listed as a separate cost on the cost estimating software. Divide the basement cost by the square footage of the basement to get the basement cost per sq ft. I really want to thank you for putting together a very practical website. Your eBook is the best source of information for a new owner-builder. I am looking for cost estimates for experienced subcontractors and building material suppliers. This is the most puzzling part for me. For basement construction what would be the cost per square foot estimate for a concrete block foundation if I were to buy all the building materials? By using construction estimating software you can break out the foundation and excavating costs as separate line items to determine what the cost per square foot for just the basement is. Now, simply divide the total cost of the foundation and excavation categories by the square footage of the basement and you will have the cost per square foot for just the basement. The total foundation cost will reflect the information you inputted to the cost estimating software. For a concrete block foundation, I would check off either Quality Class # 4 or # 5 for the foundation shape category selection on the cost to build calculator. If the concrete block foundation is to be a simple square with 8 or 9 foot walls, I would use #5. If the concrete block foundation has higher walls due to building on a slope, or if it has a more complicated shape or design, I would use # 4 or higher. While on the subject, for estimating the per square foot cost of a concrete slab foundation I would use Quality Class # 6...unless it was a raised concrete slab foundation, then I would use the same quality class as concrete block. For concrete foundation walls, either poured concrete walls or preformed concrete walls, I would use #'s 4, 3, 2 or 1 depending on the over all design and quality of the whole house. Remember, this is not an exact estimate at this point in time and it is best to have the cost to build estimate come out on the high side. Note: The cost for the foundation category will only slightly reflect as to whether or not it is to be a finished basement or an unfinished basement. 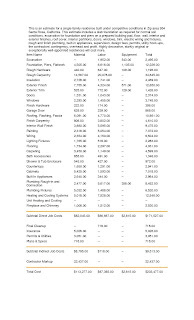 Most finish basement costs are reflected in other categories such as carpentry, electrical, etc. 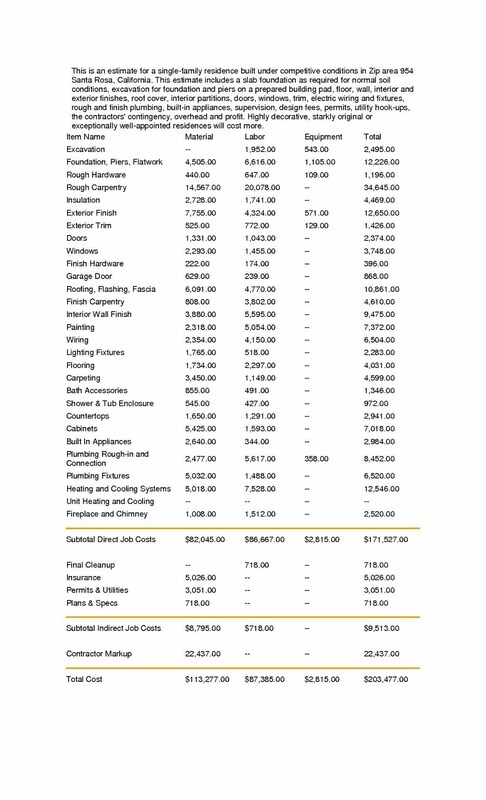 You may want to also read Basement Construction Cost. You can use the construction estimating software for any home plan you choose.